The Daily Mirror and other newspapers are trailing a documentary to be shown tonight on ITV1, called: Killer Lorries. The programme claims foreign lorry drivers are breaking UK safety laws and risking lives. They are three times more likely to have a crash than local truckers. In 2006, 1,322 people were hurt and 44 killed by trucks from abroad, and accidents are up 50 percent in five years. Their drivers are four times more likely to drive while tired but police are powerless to prosecute. 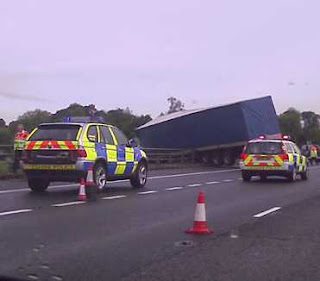 The programme, we are told, interviews Chief Insp Phil Hibbert, who says: "We would like to see an extra provision for us to be able to fine lorries at the roadside." Of course, this is absolutely nothing new – and is a subject we have raised on this blog. It was also raised last year by The Times. Hundreds of people have now died unnecessarily and thousands more have been injured, yet the reason nothing has been done is because controls which discriminate against foreign truckers run contrary to EU law. So, while the DfT sits idly by on this, it is interesting to note its new-found enthusiasm for tightening up drink-driving laws, all on the rather dubious proposition that it could save "up to" 65 lives a year. It would thus seem that saving lives is a somewhat selective concern. "Europe" will only permit such life-saving measures if they further the interests of European integration, which gives "dying for Europe" a whole new meaning. At noon yesterday (Iraq time), Shi'ite militia were reported to be storming a state TV facility in Basra, forcing Iraqi military guards surrounding the building to flee and setting armoured vehicles on fire. 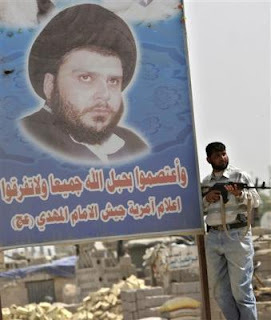 Nothing seemed better to illustrate the degree to which Maliki's troops had lost the initiative yet, hours later, Muqtada al-Sadr seemed to be throwing in the towel, calling on his Mehdi Army to cease their attacks on Iraqi security forces. If this development surprised most people (including us), Reuters is claiming that it even caught Sadr’s own followers off guard especially – or so it seems - as Maliki is offering no concessions and has pledged to continue his military operations in Basra. The immediate response seems to have been a lull in the fighting, according to local sources, although attacks are not expected to cease completely. Some even suggest that the "truce" may not stick. As of last night, the Iraqi Army began a systematic cleansing of downtown Basra and its southern suburbs, meeting minimal resistance. The criminal cartels struck at police stations in the northern portion of the city that the Army has decided not to contest for the time being as they roll up the gangsters in the more economically sensitive areas of the city. …the trend has been diminishing resistance when faced with Iraqi military units who have performed exceedingly well. 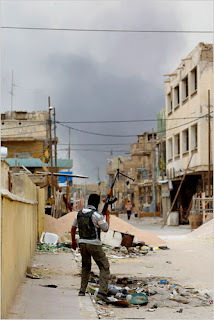 More and more areas that witnessed flare-ups are calming down as Mahdi Army loyalists run out of supplies and escape into hiding. Maliki is growing more defiant and confident and this sentiment in running down the chain of command. All political attempts to broker a ceasefire by involving Ayotallah Sistani's office have been rebuffed by Maliki and by Sistani himself from the looks of it. In two weeks, the dust will settle and this episode will be remembered as a major victory for Maliki and the Iraqi state. But no journalists will be fired, no self-described "experts" will be publicly ridiculed; no one will be held accountable for all these distortions. But the distorters will know, deep down inside, that they are frauds and this realization will slowly eat away at them. And that's the silver lining. To start with, the Americans don't know Basra all that well having had subcontracted handling things down there to the feckless Brits. It isn't surprising that the British media, influenced as they are by how British diplomats, officers and spooks gauge things, are writing-up Basra’s news with such overblown gloom: those same British officials have their careers on the line since it was their pathetic shortcomings that led to the miserable condition that Basra is in, and it’s in their interest to present the situation as intractable. If Maliki succeeds, then there should be follow-up investigation as to why the British failed in so lucrative an economic prize as Basra and Amara - the two provinces they were tasked with - so those folks who've got their reputations on the line want to make darn sure that no one walks away with the impression that Basra is salvageable. For now, the Brits are hunkered down in Basra Airport, far away from the action, where they've been taking attacks - both of the explosive variety in addition to random pilfering and looting - by whatever bunch of bored Basrawi teenagers decide to pick on them on any given day. No wonder they are dismissed by both officials and townspeople in Basra as "wimps" and "sissies". So one can safely assume that the British are as clueless as the Americans when it comes to Basra. Interestingly, Longwar Journal seems to support the upbeat assessment, calculating that the Mehdi Army has taken significant casualties, while Time Magazine reports that there has been "a large-scale retreat" of the Mahdi Army because of low morale and because ammunition is low due to the closure of the Iranian border. Yet, there is clearly a media narrative which is almost consistent through contemporary reports, the latest bulletin from The Daily Telegraph, for instance, referring to the "struggling Iraqi army and police operation in Basra." Purely on their own internal logic, however, the negative reports have to be inconsistent. If the Mehdi Army was being so successful and the Iraqi Army in such disarray, then one would hardly have expected Moqtada al-Sadr to have ordered his fighters to stand down. Clearly, there is far more going on here than we are being told and reports on which one should be able to rely must be treated with the greatest caution. Thus, while the NYT writes of street clashes persisting in Basra and other cities, things could be far better than has been indicated. On the face of it, this is good news for Gordon Brown, as the need for a full-scale British intervention could be less likely than has been indicated, and might suggest that British forces could soon be returning home. However, with no statement forthcoming from the prime minister after six days of fighting, we are none the wiser as to what his appreciation of the situation is, and what his intentions are. It really is quite unacceptable that, where major events such as these are afoot, where the vital interests of the UK are involved, our prime minister cannot even be bothered to keep us informed. "Unless journalists become more clued-up as to where that power now resides, ever more of the media's coverage of British politics will be reduced to irrelevant fluff." So writes Booker today, picking up on the theme we have been running on this blog, here, here and here. This is a theme to which my co-editor also refers, to which we added another example yesterday, with Booker bringing to the table his own example. We are, in our own ways, highlighting what Booker calls "the remarkable missing dimension" in the way politics are now discussed, the "elephant in the room", which is that our real government is no longer in London but in Brussels. When the history of our final decline as a nation comes to be written, analysts will no doubt be fascinated by the phenomenon that we are increasingly seeing – that as more and more powers are leached away to Brussels, our media and politicians talk less and less about the European Union. In the end, the only people the politicians will be fooling will be themselves, but it really is quite remarkable, as a social phenomenon, how powerful that self-delusion has become and how many otherwise intelligent people are prepared to play along with it. One supposes that the truth is simply too awful to acknowledge, so our politicos simply pretend that things are not the way they are. If their delusions were not so dangerous, they would be the objects of our pity. Maliki seems to have made two errors so far. On the one hand, he has clearly over-estimated the capabilities of his own troops. On the other, he has under-estimated the resolve and tenacity of the Shia militias. As a result – certainly according to the New York Times - his military adventure seems to have backfired on him, with militiamen in Basra in open control of wide swaths of the city, using these areas to stage "increasingly bold raids" on Iraqi government forces. After five days of fighting, politicians and commentators alike are freely referring to the "stalled assault". Witnesses on the scene are reporting that members of the Mehdi Army have been setting up checkpoints and controlling traffic, in many places ringing the central district controlled by some of the 30,000 Iraqi Army and police forces involved in the assault. As the violence has spread to Shi'ite districts of Baghdad and other places in Iraq, there are genuine fears that all the security gains achieved over the last year could be at risk. Nadeem al-Jabiri, a Parliament member from the Fadhila Party, believes that, instead of solving the problems in Basra, Maliki has "escalated the situation." Quite where that leaves the coalition forces is anyone's guess. US aircraft have been in action for the third day running, and British artillery intervened in the ground war to take out a mortar crew which was troubling Iraqi forces. 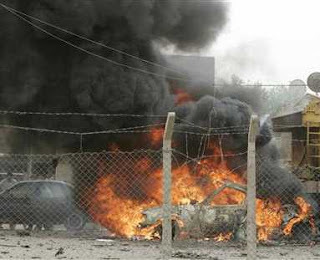 That did not stop, however, mortar bombs raining down in the late afternoon on the area of the Presidential Palace and the Shatt al Arab hotel – the former British base, where the Iraqi assault has its operations centre. Recognising the gravity of the situation, The Times is suggesting that the future of the whole of Iraq could be decided by the struggle in Basra. And, in a piece in the Sunday Herald, Trevor Royle suggests that this could be the "tipping point" for Iraq as the country slides inexorably into civil war. Forecasts of such a descent have oft been made and, by the skin of its teeth, Iraq has managed to pull through. But this time it might be different. Moqtada al-Sadr has rejected out of hand the demand that his followers should disarm and is now sitting astride the economic arteries of Iraq. 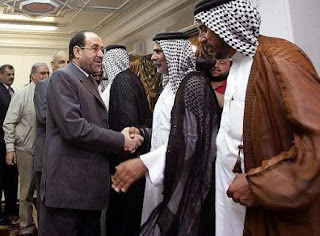 Maliki cannot afford to ignore the challenge and, if he does not have the wherewithal to take on the Mehdi, he is going to have to ask for help. And, unless the coalition is prepared to cede 80 percent of the economy to the militias, they are going to have to give it. At stake in Basra, says the NYT is not just the prime minister's reputation, his prospects for provincial elections this autumn and control of the Iraqi oil fields, but also an entire coalition strategy of reduced troop levels, steady withdrawal and the turning over of Iraqi security to local troops. If Maliki's crackdown fails, the paper says, both London and Washington may have to reassess Iraqi army capabilities and the risk of future disaster if coalition forces continue to withdraw. "This is a precarious situation," one US official said: "There's a lot to be gained and a lot to lose." Much though, it seems, has already been lost. The recriminations have already started, with US accusations that the Brits handed over Basra too early. But, while the British troops continue to patrol their base perimeter (pictured), there is still no word from Gordon Brown. We understand, however, that Des Browne will confirm later this week that there will be no withdrawal of UK troops from Iraq this spring. Government sources are saying that withdrawal at this time would be "presentationally unacceptable". ...the use of two words. No, they are not please and thank you (and, anyway, that’s three words) or, even hocus-pocus. The words are Union and European. We would really all get on much better if our hacks did learn them. For one thing, their articles would make sense. Let me refer briefly to a couple of examples in yesterday’s Daily Telegraph. 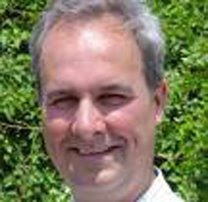 Example number one is Iain Dale, the journalist, as opposed to Iain Dale the blogger, with whom I have no quarrel even if I do not find all those politicos and wannabe politicos he keeps writing about particularly interesting. Anyway, that article. It was about the proposed electoral reform, whose details, as one would expect from formerly disastrous Chancellor of the Exchequer, presently disastrous Prime Minister Brown, are so complicated as to defy simple analysis. In itself an electoral reform is not necessarily a bad thing – we have had several in the past and they had mixed results. One member per constituency, elected directly first past the post is a system that developed over centuries and has many merits (as well as some demerits), not least the fact that the result does not require coalition governments in which certain small parties (in our case probably the Lib-Dims) are a permanent fixture. Presumably, the suggestion that we should be discussing some form of an alternative vote system, in fact, a complicated proportional representation aims precisely at that. What with compulsory voting, state funded political parties and an electoral system that ensures a more or less permanent left-of-centre coalition, the successful British political model is on track to being changed into the unstable and unsuccessful Continental one that has given us many a crisis of lesser and greater seriousness in the last 100 years. Goody-goody. And all because politicians still have not grasped that there is a reason why people do not turn out to elections and the reason lies in them and the system they have constructed (with, to be fair, the tacit agreement of the people). So I don’t precisely disagree with Iain Dale, the columnist, though perhaps my worry about the Conservative Party’s future is slightly less fervent than his. Where he and I part company is in the title: “Is electoral reform a way of keeping the Tories out of power for ever?”. This is not a sub-editor’s folly as the word power keeps recurring in the article. What makes Mr Dale think that people in office in this country are in power? Has he not realized that between seventy and eighty per cent of our legislation comes from the EU and cannot be discarded by Parliament? Did he not observe Prime Minister Brown pleading with the European Commission to be allowed to reduce VAT twice now – once on fuel in 1997 and more recently on “green” goods? How is a Prime Minister who has to plead with another political body, which is not our Parliament, to be allowed to change the rate of taxation in power? Will it be any different with the Conservatives? Alas, no. In fact, given that by that time the Constitutional Reform Lisbon Treaty will have been implemented, matters will be even worse. We are talking about office; we are talking about trappings of power; we may even be talking of the corruption of power. We are not talking about power and the use of two words, Union and European might have sorted that problem out without any difficulty. On to another example: Jeff Randall. I write this with a heavy heart, for I am an admirer of Mr Randall’s work, considering him to be the best writer on matters economic the Telegraph newspapers have possessed since Bill Jamieson took up residence in the northern parts of this island. Mr Randall’s article was about the railways and the appalling ineptitude with which they are run. In fact, the privatized railway system is almost as bad, though not quite, as British Rail used to be. Opponents claim that European Union rules would prevent the realignment of track and operations, but, as the French and others have proved, if a national government really wants to achieve something there is always a route round the road block. Yes, well. There is, in fact a directive that tells us what we can and what we cannot do. Mr Randall may or may not know this but his article shows no evidence of any understanding. Council Directive 91/440/EEC of 29 July 1991 on the development of the Community's railways is fairly precise in that it demands privatization of the railways and separation of track and train. This is not to be disregarded, no matter how bad Mr Randall’s experiences are in his daily journeys from Shenfield to London and back again. It is, in fact, the separation of accounts that is compulsory and the organizational or institutional separation optional. The French government did not ignore or circumvent the directive, merely complied with its provisions. How easy it would be to reverse the Conservative faux pas, I cannot tell, not being a transport geek. But I am certain that it would be cheaper and much closer to the instructions from our real government than the present process of virtual renationalization that is not, in any case, yielding efficient results. Member States may exclude from the scope of this Directive railway undertakings whose activity is limited to the provision of solely urban, suburban or regional services. That particular mess has been created entirely through domestic means. The funny thing is that The Daily Mail is supposed to be a "eurosceptic" newspaper. Yet, in its front-page piece today on dropping the drink-drive limit from 80mg of alcohol per 100ml of blood to 50mg, the one thing it does not mention is the European Union. Never mind that, during the course of the Road Safety Bill, year before last, ministers were advised that there was no value in dropping the limit or – the other "proposal" – introducing random testing. There are already insufficient police resources devoted to enforcing the existing limit and, on a purely cost-effective basis, the greatest benefit to public safety would be achieved by targeting that small group of drinkers that regularly exceeds the current limit be a significant amount. That was to reckon without the European Union. 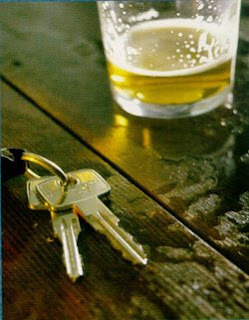 As we pointed out in May 2004, the EU commission is determined that all member states should fall into line and have common limits on drink driving. But, when The Daily Telegraph picked it up last year, and again today, even that newspaper cannot bring itself to remark that this initiative is being driven by the European Union. Yet, if this goes ahead – which it undoubtedly will - The Mail reckons up to 200,000 drivers a year will lose their licences - double the present number. For this, we had the privilege of paying £4.1 billion net to the EU in the period 2007-8. In 2008-09, the EU will cost us £6.1 billion net. In 2009-10, it will be £6.4 billion. We must be seriously barking mad. It is hard to agree with the BBC's news values, which elevates the baggage-handling glitches in Heathrow's new Terminal 5 to the status of a national crisis – running it as lead item on all its bulletins. This is by no means the first new terminal which has had teething problems – Denver and Hong Kong come to mind – and any damage done to Britain's reputation will be transitory and quickly forgotten. Not so the mounting crisis in southern Iraq, to which the BBC allocated the sixth slot on the early evening television news - allowing just thirty seconds for the newscaster to tell us that Bush had said that Iraq was facing a new "defining moment" – with no mention at all on the main radio World Tonight bulletin. We make no apologies, therefore, for returning to the subject. Our media and politicians may want to run and hide – but in every sense Britain's international reputation is on the line. The behaviour of our government over the next few days, good or bad, will have a lasting effect. Bush is absolutely right – this is a "defining moment", but for Britain as well as Iraq. The Times makes no bones about it, headlining that "…civil war looms with Shia militia", retailing an account that RAF Tornado GR4 bombers had flown low over the city and fired warning shots at positions around Basra. Meanwhile, the heavily armed 1 Scots Guards battle group, equipped with Challenger 2 tanks and Warrior armoured vehicles, was on alert and ready to leave its fortified base. This paper tells us that the Iraqi Army has not yet asked for British troops to join the battle against Shia militia, which left the remaining 4,000 troops sitting watching from Basra airport, "as the Iraqi Army it helped to create struggled to defeat militias the British allowed to flourish in the city". As an indicator of the extraordinary pressures building up under the surface, we are indebted to The Daily Telegraph. In an uncorroborated piece - which nevertheless has the ring of truth - its headline is, "Rift between UK diplomats and Army in Basra," with Damien McElroy writing that British forces are facing increasing pressure to intervene in fighting. He tells us that, "Signs of a rift were growing among British officials as diplomats said that UK forces 'stand ready to support' Iraqi soldiers as and when requested, contradicting military statements that UK forces would be confined to 'niche' roles." This is contrary to what one might expect – the military being keen to intervene while the foreign office holds back, but McElroy says otherwise. He cites Christopher Prentice, the ambassador to Iraq, who has "signalled his differences with the MoD" in a statement: "British Coalition Forces, in their overwatch role, stand ready to support Iraqi Security Forces operationally, as and when the (government of Iraq) requests this." This contrasts with official military spokesman, Major Tom Holloway, who states that coalition intervention would be confined to "niche" capabilities, declaring that, "as we speak we are not planning to go to the city." Nevertheless, The Telegraph cites a "British official based in Baghdad" who says that despite the British ambassador's statement, "Army chiefs appeared determined to resist Iraqi and American pressure for British troops to reinforce local units." This official has it that, "It's ridiculous for Britain's position in Iraq that we've got this firepower down there and we're not willing to help the Iraqis out." Yet, he says, "The Army won't even listen to suggestions it might be needed." Just how true this all is we have no immediate means of knowing, but the very fact that The Telegraph is signalling disagreements between arms of government suggests that there should be rapid political intervention, to set the British position clear. So far though, all we have from Downing Street is that it is, "not really appropriate to comment on operational matters." This is an operational matter? But it looks as if time is running out. Red Cross and other welfare organisations are concerned that food and water shortages are creating a humanitarian crisis in the city. Presumably, we can expect a statement from Brown in parliament on Monday although, as things stand, the situation may deteriorate before then, which might force the prime minister's hand. Even now, though, the lack of comment and signs of leadership from the prime minister do not bode well. The lack of leadership and direction is beginning to show, which makes you wonder whether there is anyone at the helm – and, for that matter, whether anyone cares. Though Geert Wilders’s film Fitna, which is less than totally complimentary about Islam, the Qu’ran and, above all, terrorism committed in the name of Islam, is now available on the internet, I am actually finding it hard to link to it. Some of our readers might have better luck, though, as Charles Johnson on Little Green Footballs points out, some of the scenes in this 15 minute film might be harrowing. In other words, I am not in a position to pass judgement on the film. It may not be particularly accurate and it may confuse Islam with Islamism. Other people who have seen it, think that it is hard going but not particularly offensive to anyone who is not out there wanting to be offended and is threatening to kill anyone who suggests that Islam is not the most tolerant religion under the sun. In any case, the suggestion that almost all recent terrorist activity has been carried out by Islamists who quote the Qu’ran to justify their behaviour is hardly contentious. As Robert Spencer on Jihadwatch details, the protests in the Muslim countries have started already, because, as we know, Pakistan, Iran and other countries of that kind know all about freedom of speech and respect for other religions. England Expects discusses the BBC article on Geert Wilders and the omissions in it, such as the fact that Mr Wilders’s name was on the piece of paper that had been skewered to the body of Theo van Gogh (spelling Mr Towler/Harvey! ), the murdered film-maker. The Iranian Foreign Ministry has called on Britain, the Netherlands and the European Union to ban the film and has spoken particularly harshly about this country because the website that is hosting the film, LiveLeak, is based here. The film is described as “dirty” and provocative whose intention is to insult and, no doubt, hurt Muslims. This should not be allowed, the Iranian Foreign Ministry maintains. And if it is, there might be violence as Muslims yet again display their rage at being so insulted. 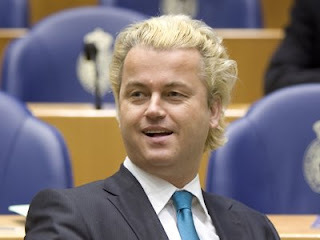 LiveLeak issued a statement Thursday saying there was no legal reason not to allow Wilders to post the film. It said the site's policy is to remain unbiased and allow freedom of speech. Some in the Muslim community rejected the film as nothing more than dangerous anti-Islamic propaganda. As the film is on the net, it might be a little difficult for imams to travel round some Middle Eastern countries with fraudulent versions of it as Abu Laban did with the Danish cartoons as we wrote here, here and here. Meanwhile, what has been the EU’s reaction? Well, not very helpful to those of us who believe in freedom and prefer to think that if we must have governments, they should be there to protect our liberties from those who are threatening them. Well, if the Slovenian government can direct me to examples of that “mutual tolerance and respect” and explain how many other parts of the world think of them as “universal values” I shall be very happy. It would also be quite useful if some of these politicians would explain how suppressing our liberty could possibly help the Muslims who are fighting for theirs. I mean, these people wouldn’t be afraid, would they? 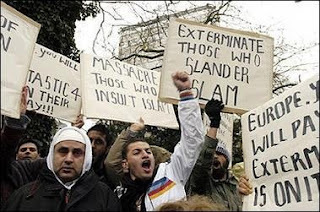 After all, you know, some of those alleged believers in mutual tolerance and respect go around demanding that all those who insult Islam be executed, massacred or exterminated. In the circumstances, I can’t resist it: here is a not very well known clip from that wonderful film with Judy Garland and Mickey Rooney, “Babes on Broadway”. It is sort of appropriate. Enjoy! But have a hankie at the ready. LiveLink has announced that it has had to take the film down because of threats to its staff. This appears to be a victory for the forces of terror and censorship as well as the pusillanimous politicians of the EU and SecGen Ban Ki-Moon, who, inevitably, condemned the film. On the other hand, the film has already been seen by millions of people and is still available on many other internet addresses. Here are some more links. President George W. Bush speaking today – as reported by Reuters - has declared that Iraq is facing a new "defining moment". "Any government that presumes to represent the majority of people must confront criminal elements or people who think they can live outside the law and that's what taking place in Basra," Bush said at a White House news conference. "I would say that this is a defining moment in the history of a free Iraq. There have been other defining moments up to now but this is a defining moment," he said. "This is a test ... for the Iraqi government." But, not important enough for a comment by Gordon Brown. He is at the Scottish Labour party conference in Aviemore, near Inverness. The centrepiece of his speech was an attack on the SNP “not only because their policy is wrong but they are depriving people of the best chance of a future for Scotland in this new global economy." It is good to know that we have such an outwards-looking prime minister, who is right on top of events. UPDATE: "Britain sits on sidelines as Iraq's Basra burns" – latest from Reuters. It is interesting how, when the real world intrudes, how petty and inconsequential the European Union really looks. With Sarkozy playing politics with defence, the more important issues are highlighted by The Times which today offers a piece headed: "Iraqi militia success means Britain must fight – or admit failure". 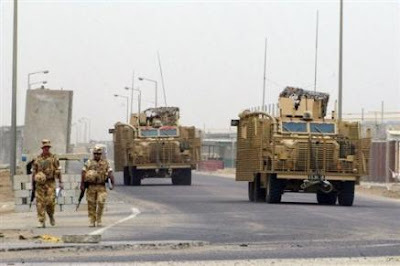 Written by Richard Beeston, the foreign editor, he tells us that the battle for Basra now raging on the streets of Iraq's second city shows every sign of turning into a nightmare for the dwindling British forces based near by. …would mean an ignominious withdrawal and handing over control of Basra to the Americans, who grudgingly would have to take over responsibility for the south. As American officers and officials have privately made clear, much of today's problems in Basra can be traced back to Britain's failure to commit the forces necessary to control Basra and southern Iraq in general. What is bizarre about all this is that, while President Bush judged the situation in Basra as serious enough for him to make an early statement, as far as we can see there has been no official statement from Gordon Brown – not even the leader of the opposition. Any idea that there might be a crisis in Iraq – in which the British government has a direct involvement and for which it is largely responsible – seems to be totally off the political radar. Already, we are hearing that coalition forces are providing air support, although there seems some confusion in the media as to whether British or US assets are being used. 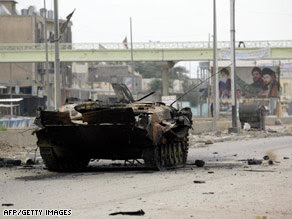 With the insurgents quite obviously giving the Iraqi Army a run for its money – the picture (top left) shows a burnt-out a Polish-built Dzik 3 APC, which the Iraqi forces paraded with such pride at the beginning of last year. This sad wreckage, in a way, is symbolic of the dashed aspirations, ironic given the latest MoD puff which shows British Warriors escorting two Dzik 3s (above). It does not seem to us that Gordon Brown can remain forever in denial. Sooner or later, he is going to have to make his government's intentions clear. Forget Sarkozy and the fluff attendant on his state visit to the UK. Far greater events are afoot, which will shape Britain’s image as a military power or cement the view that it is a busted flush with no worthwhile global influence. We write, of course, of the developing situation in Basra. Although consigned to the inside pages of the major newspapers, the outcome of the current violence – as we indicated earlier - will have a profound effect on Britain's standing. As it stands, the situation does not look happy. 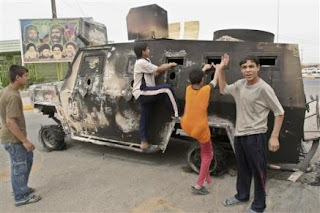 The violence is spreading, the agencies are carrying multiple pictures of burnt-put Iraqi security force vehicles, gunmen in Baghdad seized a high-profile government spokesman from his home in a Shiite neighborhood, and Muqtada al-Sadr is not giving any ground. Maliki, on the other hand, has pledged "no retreat", as tens of thousands of protesters gathered to demand his resignation and saboteurs hit the oil pipelines in Basra, striking at the heart of the Iraqi economy. All reports indicate that the militias are still controlling Basra's streets, food and water is running out and there is a 24-hour curfew on vehicle movements, set to last until Sunday morning. Unless in the next few days Maliki can demonstrate signs that his security forces are getting a grip of the city, either he is going to have to ask for help, or the British are going to have to offer it – perhaps covertly. But British involvement will be hard to disguise, especially if the body-bags start coming in, yet the humiliation of not being able to offer help if it is requested will be devastating. Strangely, the British media have not made as much of this as perhaps they might, but Brown's reputation is as every bit on the line as is Maliki's. Brown's only hope is that Maliki does prevail but, in the more likely event that he does not, the world is going to be looking to Britain for its response. Perhaps because the Conservatives have focused their attention on an inquiry into Iraq, rather than the current situation, the media have lacked a domestic political focus. But, even if the Tories remain silent, it is hard to believe the Americans will hold their tongues, which will give the media plenty to report. Then, "better relations" with Sarkozy will be seen to be exactly what they are – fluff. In the balance is the far more important "special relationship" and the world-wide reputation of our military – and our government. A "lame-duck" Britain - whose troops stay hunkered down in their bunkers at Basra Airbase, while Iraq security forces loose their grip and US forces move in to restore order – is the nightmare scenario that no amount of kissing and cuddling with Sarkozy and his spouse can overcome. Brown, even now, may be regretting that he has spent so much time on grandstanding for the cameras and less time than he should working out his response to a collapse of operations in Basra. This has the makings of a "Singapore" and a "Suez" rolled into one. After Basra, people will say, things were never the same. In a previous post we noted how – even though it had opted-out of the common immigration policy – the UK was "tweaking" its own to bring it into line with EU laws, in order to prevent the UK becoming a "back door" for the rest of the EU. However, it remains the case that, once a third country immigrant has entered any member state and managed to qualify for citizenship of that country (usually after five year's permanent residence), they also become "EU citizens". As such, Directive 2004/38/EC applies. They then enjoy "freedom of movement" and "freedom of establishment" and can move to any other member state - such as Britain - where they cannot be prevented entry. After a qualifying period of residence in Britain, they can then apply for British citizenship (not that they need to, as they have absolute rights of residence). The authorities cannot refuse them – even if, had they entered directly from their original third countries, they could have been turned back on arrival. Furthermore, under the terms of the Directive, they can then bring their spouses, their children, their own parents and their in-laws, and even cousins if they are dependants. Public concern over immigration has led the government to announce a stop on unskilled workers arriving from non-EU countries. But every year refugees and immigrants who have gained citizenship elsewhere in the EU migrate for a second time - to Britain. It seems that the other member states are somewhat less concerned about our sensibilities. Read the rest of the report here - it really does make a nonsense of our "opt-out". So, Nick the Sark, complete with elevator heels, has met Mrs Betty Windsor, EU citizen. And, as well as being a "colleague", sitting on the European Council alongside our prime minister, our Nick wants to be friends as well. Particularly in the frame is "co-operation" on the economy and immigration, the latter undoubtedly meaning that we should take more of the human flotsam which ends up at Calais. In return for that, we get to send little Gordy to Washington to plead with Bush to stabilise the dollar so that France doesn't have so many problems exporting to the United States. Nick is also suggesting that he might send another 1,000 troops to Afghanistan – under terms and conditions as yet unspecified – the deal being that France rejoins Nato and a French general takes over its running (or something like that). Then there is the possibility of a deal on nuclear energy, where the French build all our power stations and then we help pay for French engineers to sell similar power stations throughout the world. All this is dressed up in glowing terms as, "a new Franco-British brotherhood," with Nick telling us that we ought to get together as "we have the same enemies throughout the world." Not quite right is that. He forgot to count the French. Today, though, is the day of the gliz, parading the new trophy wife – in flat heels – and being nicey nicey to all and sundry. The real stitch-up starts tomorrow when the two leaders get down to business. It will then take some time for us to find out precisely how we have been shafted but that will emerge in the fullness of time. Cynical? Moi? Mais, non monsieur! Dominating the news today is the Financial Service Authority's (FSA) admissions of failure over its handling on Northern Rock. But the more fundamental question, also being discussed today, is the relative role of the Bank of England in what is termed the "tripartite system" of regulation, involving the Treasury, the Bank of England and the FSA. This has been heavily criticised for its failings that prevented it identifying potential problems at Northern Rock. The FSA itself is today telling us that it would seek to improve the "tripartite" structure of financial regulation, thereby admitting that there are failings in the system. But, in referring to the very term "tripartite", the FSA is being disingenuous to the point of being deliberately dishonest. The current system does not comprise three legs but four, the fourth being the European Union. This is what is known formally as the "4 level regulatory approach" which was pioneered in the 2001 Lamfalussy Report. 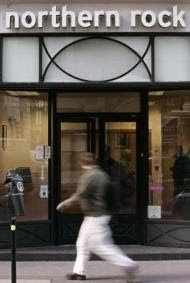 That structure has been willingly adopted by the British government, of which a key part is the fronting of the Financial Services Authority as the "competent authority" to deal with the raft of EU regulatory measures which are being developed under the Financial Services Action Plan. Under the Lamfalussy system, the regulatory agencies rather than the central banks assume the core responsibilities for the banking system. That the FSA is currently so quiet about its central role in the EU's scheme to regulate the "European" financial services industry cannot be accidental. It is very open about the system on its web site and in various speeches given by officials. Yet it is that very system, and the fatal confusion of responsibilities and powers, which were largely responsible for the inadequate response to the Northern Rock crisis, which the governor of the Bank of England himself admitted. Not since, however, has the role of the EU been acknowledged and you will not find any mention of the "sleeping partner" in the rush of publicity about Northern Rock in today's media reports. So it is that the "elephant in the room" of the EU dominates our politics, yet no one wants to admit it is there. We saw this with the Gurkhas and we see it lurking in the background with the Human Fertilisation and Embryology Bill. In fact, there is now not one "elephant" but a whole herd, stripping the vegetation and despoiling the landscape. But still, our regulators do not want to admit it and our media does not want to see it. Soon enough, we will drown in the pile of excrement it produces, and the media will not even have noticed the smell. Famously or infamously, Dr Johnson is supposed to have described patriotism “as the last refuge of the scoundrel”. Ever since Boswell quoted it in his biography of the great curmudgeon, the sentence and its meaning have been widely debated. On the whole, most people agree that true patriotism is not being impugned here but that Dr Johnson was acutely conscious of the number of scoundrels who would … well how would one put it? …. drape themselves in the flag for their own purposes. That was my obligatory hit at the Prime Minister and his unpleasantly scoundrelly patriotism. Dr Johnson would not have like him or his opponent, the Boy-King of the Conservative Party much. Here is another concept to which all sorts of people, scoundrels and just plain ignoramuses stream – the nation state. There is nothing wrong with the nations state, assuming you can define it, but there is not much right with it either. Not by itself, that is. Some nation states are liberal and constitutional democracies; some are rather ghastly authoritarian monstrosities. The Treaty of Westphalia is no help at all, as the concept of the nation state did not exist in 1648. Most of the states involved in the war it brought to an end were German and France cheerfully grabbed several German statelets all for her own. The Bishopric of Metz and Alsace, for example, changed from being parts of the Holy Roman Empire to being parts of the French nation state and areas for French soldiers to die for. Some nation states are successful amalgams of many other nations, such as the United States, Canada and Australia; most modern nation states have various ethnic ancestries to a greater or lesser degree; one of the most puzzling nation states is Switzerland that seems to have forged itself from various cantons, four languages and two religions; and many parts of the world find it hard to draw precise boundaries between nation states with constant frictions around the border areas. Nevertheless, the nation state has become a mantra not only for those who oppose supranational and unaccountable organizations but those who oppose Western intervention in various places, sometimes for good, more often for not very good reasons. In fact, too many supporters of the nation state seem to have become supporters of the worst dictatorships around. Serbia is being supported in the UN by Russia and China. Birds of a feather, I suppose, and I have no doubt those commentators in Britain who are weeping about Serbia are very proud of being on the same side as those two countries. As this blog predicted there has been little practical support from either of the big countries for Serbia as that country and Kosovo are hardly Russia’s, let alone China’s problem. Interestingly enough, however, numerous supporters of Serbia’s “rightful” claims to Kosovo, which can, at least, be argued, have shown themselves to be supporters of Russia and China as well. Apparently these two highly oppressive states, whose record in keeping whole nations imprisoned is formidable, are, in reality, defenders of the nation state. As far as Russia is concerned, I can think of a number of nation states or just nations who would disagree with that scoundrelly point of view. Start with Finland in the north and move down and round eastward – you will find many states and nations with strong views on Russia. Presumably, according to these vociferous proponents of the nation state, those who oppose oppression by a real tyranny, like Russia or China have no rights to their nationhood, let alone a state. Thus Georgia and Ukraine, nation states both, have no right to make decisions for their security if Russia says boo to some European countries it has managed to control through the supply of gas and oil. Then there is China, the imminent host of the Olympic Games, handed over by the despicable and obsequious, not to mention corrupt, IOC on condition, or so it was said at the time, of the country improving its human rights record just prior to the Porcine Air Force taking to the skies in large numbers. Of course, China has not improved its human rights record and has, in preparation for the great event, been rounding up journalists, bloggers, dissidents and people who protest against illegal land grabs. But hey, this is all done in the name of the nation state and we must not criticize. The recent events in Tibet and among Tibetan communities across the world have invoked not just a serious crack-down by the Chinese authorities and a recourse to the usual methods of re-education but also some curious configuration in opinion. It is not surprising that most Chinese blogs took an anti-Tibetan line though there was minimal reporting of events inside the country. Unlike western supporters of Chinese action they did not deny or minimize the fact that Tibetans are a different nationality; they simply did not consider it important. Everyone under Han Chinese rule should be pleased to be so. Besides, teaching of history in China tends to be somewhat one sided and Tibet is described as having been Chinese throughout its history, something that is palpably untrue but is believed by an astonishing number of people in the West as well. Those who believed that Kosovo was “always” Serb, everything Russia claims was “always” Russian, also believe that Tibet was “always” Chinese and is part of the Chinese nation state despite being a different nation and despite having been a more or less separate state for much of its history. This rather dubious belief makes it acceptable for China to suppress as brutally as it likes any sign of Tibetans wanting to live by their own laws and rules. After all, as numerous responses on various blogs and, indeed, some blogs said, we get soooooooooooooo many lies about China in the media. The country is really a great peace-loving and just ordinarily loving family with those nasty Tibetans rioting, which was the only event that resulted in deaths. Since the official Chinese media said so, it must be true. Some responses on Iain Dale’s extremely sensible comment about Gordon Brown admiring Chinese local democracy raved about the West being far worse, whatever the Chinese government may do. The whole story says a lot about Gordon Brown and about vociferous supporters of the nation state, which seems to have become an excuse to support some of the worst tyrannies in the world. Even Chinese writers and journalists, not to mention some bloggers, are calling for discussions with Tibetan monks and leaders. Perhaps, they are not quite so obsessed with that nation state concept. Curiously enough, the great supporters of the nation state find themselves on the same side as the most egregious and corrupt of all tranzis, the IOC, that is twisting and turning but refusing to do more than tut-tut mildly at what is going on in China. Actually, we do not know most of it, as the rather mysterious half-stories about the Uigharts show. Something is wrong in that region as well but it is harder to find out. Those of our readers who are not obsessed with the glories of the nation state, particularly if they are run by bloody tyrants, might like to know that protests are being planned in London on April 6 when the Olympic torch, lit by a pretty Greek actress in a faux ancient outfit while pro-Tibet demonstrators were dragged off by the Greek police, will be carried through this great city of ours. Nearer the time I shall write more about it but here is the link to those organizing the Free Tibet side of it. There will also be protests about the treatment of Falun Gong and the Han Chinese as well, should they step out of line. So, even if you are obsessed with the needs of the nation state, you might like to protest about this particular nation state (or something like it) being given so much free publicity by the world and its transnational organizations. My solution to the Olympics remains the same – if we cannot abolish this noxious event, let us imitate the Ancients and have it always in one place. Let us abandon this disgusting travelling circus and rounds of bribery. Which country should have it in perpetuity? Step forward Greece. The Greeks are always whining about their ancient heritage (well, parts of it – little is heard about the Spartans or what the Athenians did to other cities). Here is a great chance for them to keep that heritage alive. In return they can stop whining about the Elgin Marbles, which they are not going to get in order to put in some new museum, built on an important Byzantine site. But I digress. Right now, what matters is solidarity with those oppressed by those representatives and protectors of the nation state, the Chinese Communist authorities. Given all the kerfuffle about the deeply controversial Human Fertilisation and Embryology Bill, it is surprising – or perhaps not – that none of the commentators have stopped to think why the government has put itself on the line, risking enormous disruption within its own ranks. Like with so many things though, the government is working to a different agenda, one which transcends mere national politics, where it must honour commitments made elsewhere, to a higher power. We are, of course, talking about the European Union. Even the slightest acquaintance with the issues covered by this Bill will reveal that the agenda is largely determined by the EU, with stem-cell research and allied matters forming one of the central planks of the EU’s 2010 Lisbon agenda – developing the so-called "knowledge-based economy". For some years now, ministers have thus been extolling the virtues of the "European biotechnology sector", which this Bill does much to promote, and the EU has constantly affirmed its commitment to developing this sector. In promulgating the Bill, therefore, the government is primarily supporting a line agreed with the "colleagues". In so doing, it is paving the way for the newly emerging "industry" to be controlled and regulated by "Brussels", which will use Single Market regulation and its own research budget to that effect. In the short-term, therefore, MPs may be allowed their tiny rebellions, but in the longer term the agenda has already been set. The government will keep coming back for more, until the final shape of the industry – and its regulatory framework - has been determined. What MPs think, individually or collectively, is of very little importance. Within that overarching context, one looks with the usual level of cynicism at the prattling of the media and the political groupies, and especially the lead editorial in The Daily Telegraph which welcomes Gordon Brown's decision to allow a free vote on certain aspects of the Bill. His concession, the paper says, "is extremely good news not only for those MPs who have religious objections to some parts of the legislation, but also for the general public, who are entitled to an open debate on these complex and disturbing issues." What it fails to understand is that, at best, Gordon Brown's government has allowed a few marginal concessions, which will not interrupt the main agenda that was settled a long time ago, without debate and without the involvement of Westminster. Nevertheless, captivated by the theatre of the moment, the paper is arguing for "more free votes in the Commons in order to permit MPs some of the freedom and conscientious independence that is now enjoyed by members of the House of Lords." If it were to become accepted practice for MPs to exercise their own judgement more often, the paper adds, voters might take a greater interest in the character of the people they elected. Such a move might be a more effective antidote to voter cynicism and apathy than the programme of "constitutional reforms" introduced by the Government on Tuesday. In the posts immediately prior to this one, however, we record three issues – important in their own right, the one affecting a small but successful wine-making enterprise; the other the damaging effect of EU law on bus companies and, the other – albeit misunderstood – covering the role of the EU in determining what butchers can or cannot sell, by way of minced meat. These are but three of thousands of issues which are determined outside Westminster, part of the core of the 70 percent of more of our laws which are decided in Brussels, by the European Union, over which our MPs have no control whatsoever. ...but it is even more difficult to see how the democratic process could be reinvigorated when most of our law is made outside the reach of our democratic institutions. Voters, the paper concludes, are now so disillusioned by a governing party that reneged on a manifesto pledge for an EU referendum and is pushing post office closures its own MPs are campaigning against (no free vote on either) that they are unlikely to be persuaded that these changes are anything more than cosmetic. For those of us who have watched Parliament slide increasingly into irrelevance, more free votes would indeed be a cosmetic change. 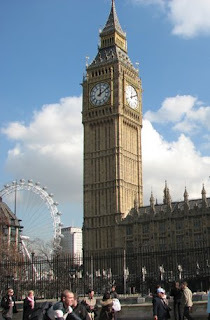 As long as, for most issues, there are no votes at all, MPs are simply masters of irrelevance. Although the events in Basra were the lead item on the BBC Radio 4 World Tonight programme yesterday, there is very little by way of detail to add, beyond that which we were able to glean yesterday morning. However, make no mistake. This is a crucial moment in the whole five-year campaign to restore order and the semblance of democratic government in Iraq. 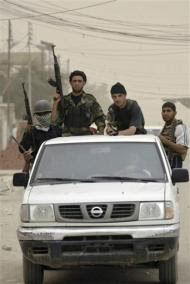 Through Basra passes ninety percent of the country's wealth and by far the bulk of the government's income. While Baghdad is the capital, Basra is the economic heart. If Basra is lost, Iraq will follow. On the line also is the entire post-war British policy on Iraq. For all that there was – by general accord – no plan in the immediate aftermath of the invasion, building up the Iraqi forces to the point where they were capable of independent operation has emerged as the policy which will best hasten the departure of British troops. Thus, having committed to progressive disengagement, and the return of all three southern Iraq provinces to Iraqi control, that policy is no undergoing its most serious test. If the Iraqi forces fail and UK (or American) troops have to intervene, then the policy will have failed and be seen to have done so. If, on the other hand, the Iraqi forces prevail, this will be a vindication of the British government’s line. That said, with events on the cusp, capable of going either way, now is most definitely not the time – if ever there is one – to commit to a lengthy and expensive inquiry on the lead-up to the war. And, given the cost of the Saville inquiry, now well over £200 million – with no promise that it will ever get to the bottom of the events of Bloody Sunday – it is arguable that there never will be a right time to hold an inquiry. More to the point, whatever mistakes may have been made in the recent past, what may prove to be either the biggest mistake or the greatest triumph of British policy is currently in the crucible. Therefore, to assess past decisions without reference to the outcome of events now unfolding would be – as lawyers like to say – otiose. In many respects, the die is cast and we can only watch and wait - and hope that the outcome is favourable. We may not know this for some months yet. As Ali al-Dabbagh - Maliki’s spokesman - said yesterday, "This operation will not come to an end in Basra without the law prevailing and being respected" – and that may be some time. There will be plenty of time, after that, for recriminations – if they are needed. A hare started by the Daily Record on the "banning" of Scottish mince is rapidly gaining currency, having evoked a piece in The Daily Mirror and a staunch condemnation in The Scotsman. Billed as an "exclusive" by the Daily Record, journalists Craig McDonald and Charlie Gall, under the headline, "Butchers vow to fight planned EU ban on Scottish mince", tell us that, "Battling butchers launched a last ditch fight to save traditional Scottish mince from meddling Eurocrats yesterday." "Brussels penpushers", we are told, "want to end the sale of properly aged beef mince - to prevent foodies poisoning themselves with raw steak tartare," with the inevitable consequence that, "Farmers and butchers say the move will push up prices and make the family favourite less tasty." Even "food bug expert" Hugh Pennington is enlisted to the cause, brought in with a quote to declare, "…the new rules won't make beef any safer". World Scotch pie champion Amos Smith is also recruited. He tells us, "It is stupid meddling and a lot of nonsense," adding, "Why should we have to fall into line for something which is about France and steak tartare? What about our culture and our mince?" A lot of nonsense it certainly is, only the nonsense is the story produced by the fearless Daily Record hacks. Not only is it not true, what is being pushed is the exact opposite of the truth. 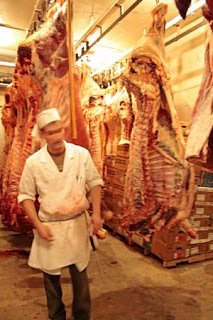 What McDonald and Gall are claiming is that, while "our butchers" traditionally hang meat for 14 to 28 days to give it flavour before cutting the carcass into joints, new (EU) health rules state meat used to make mince should be cut less than six days after an animal's slaughter. We are then informed that the Food Standards Agency "opposed the moves but have admitted defeat and are now in the process of informing butchers and food processors that the new rules must be implemented immediately." And, to cap it all we learn that, "It's feared the regulations will also push prices up as meat has to be processed more quickly - or binned if it misses the six-day limit." So, where does this all go wrong? Well, actually, the law already imposes the six-day limit, which it did via Regulation (EC) 853/2004 and, before that, Directive 94/65/EC. Amazingly, though, 853/2004 is quoted specifically by the McDonald/Gall duo, who actually cite: "Annex III, Section V, Chapter III, point 2 ( B ) to Regulation (EC) No 853/2004," apparently unaware that this came into force on 1 January 2006. Strangely, it was then that The Scotsman weighed in with its own story about banning minced meat, to which we responded with our own piece pointing out that the "ban" did not apply to local butchers producing their own mince for immediate sale. What has brought this up again, however, is not a ban but precisely the reverse. In October last year the Food Standards Agency issued a consultation on a "national measure". That proposed lifting the 6-day restriction specifically "to enable the continuation of the English tradition of ageing meat that is used to produce minced meat". However, since issuing the consultation, the Agency has been told that this national measure was not acceptable to the EU commission – in its current form. It had to be re-worked and notified "as a technical standard" rather than an adaptation of the hygiene legislation. The Agency is considering this and is consulting industry on the way forward, which means that the eventual aim of lifting the restriction is still in hand. So far from reality is the piece, however, that it is worth a study to see quite how the journalists managed to build up a huge raft of quotes, based on a complete misunderstanding of the situation. And, with the virus firmly embedded in the system, The Scotsman is a sheer delight. "Tell Eurocrats to go hang - this reheated idea is still pure mince," writes Hamish Macdonell. Alongside is The Daily Mirror which declares: "Minced beef and lamb could rise by 40p a pound," plus an editorial from the The Daily Record, completing the circle of pure fiction. Sadly, one blogger has already fallen for it while another has partially debunked the myth. The former presents the Daily Record story as, "the case for hanging EU bureaucrats". As a matter of principle, we believe they should be hanged. But not on this, another salutary example of how you can never afford to take media stories at face value. It is no wonder that the EU is so badly covered, when even a national paper with the huge resources of The Sun cannot even get a simple story right. Its latest effort in the department is a banner headline, "Fury at buses 'EU 30-mile limit'", the story purporting to tell us that "thousands of passengers are being forced to hop off buses midway through journeys to comply with barmy EU laws." So we are told, "A Brussels ruling has banned local services longer than 30 miles to ensure drivers don’t spend too long at the wheel. As a result, drivers have to pull in as they hit that limit and order everyone OFF their bus. They then change the route number on the front and invite passengers to jump back ON before resuming the trip" (the paper's emphasis). Actually – something that will not surprise any of our readers – this is not true. "Brussels" has not banned local services longer than 30 miles (50 km, if you want to be pedantic). Simply, the rules now require (since 1 January) that any bus plying a route longer than this distance must be fitted with a tachograph. This is a story we did last December and the BBC website even earlier, the latter then remarking that bus firms were complaining that the £1,000 cost of the device was too much, and would force them to split routes, causing disruption. That, in fact, is exactly what is happening, and what The Sun is now reporting although, from its copy, you would not get the first inkling of the real nature of the problem. Instead, we get a "rentaquote" insert from Lib Dem transport spokesman Norman Baker who, The Sun tells us, "blasted the 'lunatic law'". And does Baker know what he is talking about, when he says: “These rules don't stop buses running more than 30 miles… All they do is inconvenience the passengers who have to keep getting on and off. It's like an Ealing comedy"? Then we learn that he has written to transport secretary Ruth Kelly demanding an opt-out – and a fat lot of good that will do him, but it looks good for a drive-by media quote, making it look as if he is doing something constructive. The worst of it though is that The Daily Telegraph has repeated the story in what is obviously a re-write of the tabloid effort, even down to regurgitating The Sun's erroneous claim that, "Long-distance coach journeys are exempt from the law." Er… no they are not. They have had to have tachographs for years. This particular bit of legislation is extending that law to cover local routes – which is where the trouble started. But then, does it really matter that the journos are peddling shoddy goods? The fact is that they are always doing it. What really worries is that so many people still take what they write seriously, without doing their own checking. It's like old times, reading in The Daily Telegaph a classic EU "red tape folly" story which used to be the fare of the Booker column – and even a weekly column in The Daily Mail before we got fired. Anyhow, this one is about an outfit called Lurgashall Winery near Petworth, in West Sussex which has fallen foul of a new EU directive. This is grandly entitled Directive 2007/45/EC of 5 September 2007, "laying down rules on nominal quantities for prepacked products, repealing Council Directives 75/106/EEC and 80/232/EEC, and amending Council Directive 76/211/EEC". Unfortunately for Mr Jerry Schooler – now 74 - who owns the business, he has been selling his range of nine liqueurs - including bramble, walnut, ginger, sloe and strawberry - in 37.5cl bottles. The new directive, however, defines the sizes of bottles in which such products must be sold. And, while wine must be sold in 37.5cl bottles, spirits – for reasons known only to the vast intellects of EU officials – the nearest equivalent size for spirits is 35cl. An award-winning English fruit wine maker whose customers include royal palaces and the National Trust has been landed with a bill for £30,000 after the European Union ruled that he was using the wrong sized bottles. Schooler, who has been using the larger size 24 years, producing 400,000 bottles a year, faces prosecution if he does not comply with a new directive. He is thus facing a bill of £30,000, having to carry the cost of changing the bottling, the labels, machinery, boxes and maybe the corks as well. "This has just been imposed on us and all we can do is go along with it," says Schooler, according to The Times. "We fly the Union Jack and the cross of St George outside the winery and we are very pleased to do it, but sometimes life is made very difficult. I don't think I shall be flying the EU flag." So, Mr Cameron has caught up at last, telling us all that, "people in Britain are suffering price rises far in excess of the official rate of inflation." His intervention immediately gets a pat on the back from the Spectator blog, which is of course entirely oblivious to the fact that we were asking why the Boy was so silent on the issue on 13 February. Far be it for us to state the obvious – but you read it here first, well over a month ago. At the time, we hazarded the view that the Cameroons had no great incentive to talk up the issue. Acknowledgement of the true rate of inflation, we said, would simply unleash a torrent of wage claims that would have the economy teetering on the edge, and drive us even deeper into the mire – a mess that Mr Cameron and his boy chancellor would have to sort out. To that extent, therefore, we claimed there was a conspiracy of silence amongst the political classes, who were happy to make hay on the political margins, but would not address the seriousness of the problems which confront ordinary people. That Mr Cameron is indeed now raising the issue is to be welcomed. He is only saying what so many of us have been saying for months. But, in the tiresome way of British politicians, this is framed entirely in tribal terms, the focus being on, "Del Brown's addiction to statistical chicanery". The BBC responds to Cameron’s initiative by quoting Yvette Cooper, Chief Secretary to the Treasury. She tells us: "With increases in world fuel prices and a global credit squeeze, the most important thing for families is economic stability here at home to keep overall inflation and interest rates low and employment high - something the Conservatives still fail to understand." So, from both sides, we get the "biff-bam" politics that provides heat and no light. On the other side of the Channel, however, French president Sarkozy is also on the case. But, rather that indulge in the claustrophobic tribalism seen here, he is signalling that he intends to use his forthcoming presidency of the EU to push for the maintenance of agricultural subsidies. His administration is concerned to guarantee the high prices agricultural products currently fetch, a line which seems to have some support in the EU commission. One anonymous official noted: "By 2050, humankind will need to feed nine billion human beings, which means that a hectare of land currently feeding four people will have to provide for 6 instead. This is why the CAP has become a hot political topic once again." Jean Notat, a stock breeder and a board-member of the FNSEA (the French Farmers' Union federation), than adds that current crop prices present cattle breeders with a soaring bill for animal fodder. In certain areas, such as France's Brittany, he tells us that animal feed now accounts for more than 50 percent of production costs. "This is another sign that no agriculture can possibly subsist without public support," he says. The CAP is, of course, the wrong mechanism, but Notat is not wrong when he says that breeders, and others, certainly do need some sort of support (albeit temporary) if they are going to survive. But where the commission official is wrong is in declaring that, "the CAP has become a hot political topic once again". Well, he might be right on his side of the Channel. But here, we don’t do complicated issues like that. It's Tories, "biff! ", Labour, "bam!" and the theatre critics stand back and applaud.